Columbia used trickery to stun Stanford 7-0 in the 1934 Rose Bowl. Way back in simpler times, long before SportsCenter, BCS and the Chick-Fil-A Bowl, there were four major bowl games. played like clockwork, year after year, on New Year’s Day. Rose, Orange, Sugar and Cotton. The Granddaddy of them all, the Rose Bowl, began in 1902, when Michigan routed Stanford, 49-0. The following year, polo replaced football as the sports attraction. From 1904 through 1915, the Tournament of Roses held chariot races, but dwindling interest and economic factors persuaded the return to football as the main attraction in 1916. That year, Washington beat Brown, 14-0; the following year Oregon defeated Penn by the same score. In today’s world of major college football, Ivy League schools like Brown and Penn would never see the light of the Rose Bowl. Nor would Bucknell, which defeated Miami of Florida 26-0 in the inaugural Orange Bowl in 1935. That same year, Tulane edged Temple 20-14 in the first Sugar Bowl. The Mare Island Marines defeated Camp Lewis Army 19-7 as service teams supplied the competition for war-time continuance of the Tournament of Roses game. The Great Lakes Navy, led by future NFL Hall of Famers Paddy Driscoll, who passed for a touchdown and George Halas, who scored twice, beat Mare Island 17-0. Unbeaten but once tied Harvard defeated Oregon by a 7-6 margin on Arnold Horween’s kick for an extra point following a 12-yard touchdown run by Fred Church. In a stunning upset, Columbia resorted to a bit of trickery, right, by legendary coach Lou Little to upset Stanford 7-0. Al Barabas skirts 17 yards completely unmolested or detected on a hidden ball play to score the winning touchdown. The first Orange Bowl game was a blowout, Bucknell defeating Miami of Florida 26-0. The game was broadcast on CBS Radio, and recognition for south Florida was amply raised during the inaugural year. Catholic University held off a late rally by Ole Miss to prevail 20-19. Cardinal fans in D.C. managed to sweep up President Franklin Roosevelt on his way to church during a 3,000-person victory parade up Pennsylvania Avenue. A desperation 72-yard touchdown pass from tailback Boyd Brumbaugh to Ernie Hefferle spelled an end to Mississippi State’s hopes as Duquesne edged the Bulldogs 13-12. Santa Clara beat LSU two years in a row, 21-14 in 1937 and 6-0 in 1948. The Broncos also knocked off Babe Parilli and Kentucky 21-13 in the 1950 Orange Bowl. St. Mary’s 20 forced eight turnovers, built up a 20-0 lead and held off the Red Raiders for a 20-13 victory. Fordham nipped Missouri 2-0 in a game played in the rain and mud of New Orleans. The only points came in the first quarter when Fordham’s Alex Santilli blocked a punt and Stanley Ritinksi tracked it down, sliding through the end zone and out-of-bounds for a safety. Some unlikely major bowl losers in addition to Brown and Penn in the Rose Bowl were Marquette, which lost to TCU 16-6 in the first Cotton Bowl; Carnegie Tech which lost to TCU 15-7 in the 1939 Sugar Bowl; and Georgetown, which fell to Mississippi State 14-7 in the 1941 Orange Bowl. In the 1946 Orange Bowl, the winning touchdown for Miami of Florida came after time had expired. With the score tied 6-6, a pass by Holy Cross quarterback Gene DeFilippo was deflected into the arms of defensive back Al Hudson, who returned the ball 89 yards for the winning touchdown as the Hurricanes won 13-6. Most baseball fans over 40, especially Yankee fans, can still remember where they were on Thursday, August, 2, 1979, when they heard the news. That was the day Yankee captain and catcher Thurman Munson perished in a fiery plane crash in Canton, Ohio, while practicing take-offs and landings in his new Cessna Citation jet. Thirty years ago, I was a sports columnist and assistant city editor at the Fitchburg-Leominster Sentinel & Enterprise in north central Massachusetts. The newspaper’s softball team, the Deadliners, was in the midst of a close game against one of the best teams in the league when we heard about Munson. The stunned ‘Liners rallied that day to win in walk-off fashion. Over beers after the game at a local tavern, we dedicated our victory to Thurman Munson. I recently finished reading Marty Appel’s book “Munson: The Life and Death of a Yankee captain.” Appel, at one-time the Yankees PR director, co-authored Munson’s best-selling autobiography in 1978. But more important, Appel’s book it paints a picture of Munson the man from those who knew him best — his family, his friends and his teammates. Appel chronicles the last days of Thurman Munson’s life, including the plane crash that led to his untimely passing at the age of 32. Munson’s closest friends on the team, Lou Piniella and Bobby Murcer, delivered eulogies to their fallen comrade at Munson’s funeral in Canton. In his eulogy, Murcer quoted Angelo Patri, a noted American educator, author and philosopher and my great uncle. “The life of a soul on earth lasts beyond departure. You will always feel that life touching yours. The voice, speaking to you, talking to you in the familiar things he touched, worked with, loved as familiar friends. And live he did…He lived…He led…He loved. Whatever he was to each one of us….catcher,….captain….competitor…husband….father….friend….He should be remembered as a man who valued and followed the basic principles of life. The Yankees were exhausted the day they buried their captain. The had flown from New York to Ohio for the funeral early that morning, then flown back home from a Monday night baseball game with the Orioles at Yankee Stadium. That night, Murcer insisted that manager Billy Martin lput him in the lineup. He went on to drive home all five runs as the Yankees came back from a 4-0 deficit to beat Baltimore, 5-4. Murcer gave the bat he used that night to Diana Munson, Thurman’s widow. He never used it again. Jacob Ruppert’s plaque hangs in Monument Park in Yankee Stadium, but not in the Baseball Hall of Fame in Cooperstown. There are 31 pioneer/executives in the Baseball Hall of Fame — and Jacob Ruppert Jr. is not one of them. Walter O’Malley, Tom Yawkey, Barney Dreyfuss, Charlie Comiskey and Larry and Lee McPhail are in. So is Clark Griffith and Bill Veeck (as in Wreck). But no Ruppert, by George, even though he was “The Boss” long before Mr. Steinbrenner. The man who put the Yankees on the map and helped them grow into America’s most famous franchise and sports brand, the guy who signed three of the greatest players ever and won seven World Series is on the outside looking in when it comes to Cooperstown. Two of the managers who worked under Ruppert — Miller Huggins and Joe McCarthy — are in the Hall, So is his long-time general manager with the Yankees, Ed Barrow. Yet the owner who built “The House that Ruth Built” is not in the Hall of Fame. Jacob Ruppert had already make fame as a United States congressman from New York, a colonel in the National Guard, and a brewery owner when he and Tillinghast L’Hommedieu Huston acquired the Yankees in 1915. The Yankees, who were born as the Highlanders in 1903 and played their games in upper Manhattan, had been pretty much the laughingstock of the American League under the team’s first owners, Frank Farrell and William S. Devery. The Yankees had zero American League pennants, just two second place finishes, and only five seasons over .500 from their founding until Ruppert and Huston took over. The Yankees hit rock bottom in 1912 with a last place finish and a .329 winning percentage, worst in team history. They finished seventh in 1913 and sixth in 1914. Under the stewardship of Ruppert and Huston, the Yankees made steady progress starting in the 1915 season. Then in 1920 they made the move that is still talked about today, nearly 90 years later, when they purchased the contract of Babe Ruth from the Boston Red Sox for $100,000. Ruth captivated fans with his batting exploits, and soon New York became the center of the baseball universe. The Yankees won their first AL pennant in 1921 and another in 1922. That year, Ruppert bought out Huston, and became the sole owner of the Yankees. The team was just warming up. In 1923, they moved out of the Polo Grounds (where they were tenants to the New York Giants) and christened a brand new ballpark across the Harlem River in the Bronx. It didn’t take long for Yankee Stadium to become the equivalent of the Roman Coliseum. And later that year they won their first World Series, defeating the in six games. Under Ruppert’s watch, the Yankees would win another pennant in 1926 and six more World Series — 1927, 28, 32, 36, 37 and 38 — before Ruppert passed away in the winter of 1939. The Yankees dominated baseball throughout a good portion of the 1920s and 1930s, including the Murderers’ Row team of 1927 that many consider the greatest team ever. In addition to Ruth, Ruppert signed immortal first baseman Lou Gehrig to a Yankee contact in 1923, and the legendary Joe DiMaggio 11 years later. A total of 13 Hall of Famers spent considerable time in the pinstripes during the Ruppert regime: Ruth, Gehrig, DiMaggo, Home Run Baker, Earl Combs, Bill Dickey, Leo Durocher, Lefty Gomez, Waite Hoyt, Tony Lazzeri, Herb Pennock, Red Ruffing and Joe Sewell. 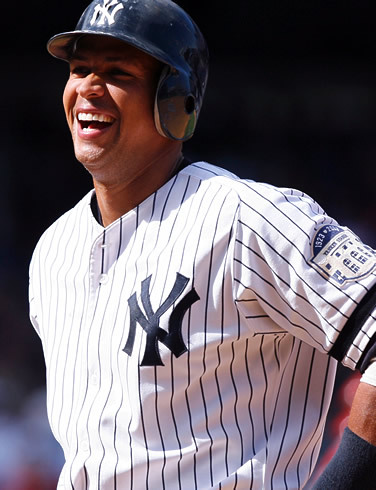 Everyone loves a parade, especially Alex Rodriguez, who came back from the depths to help lead the Yankees to a World Series win over the Phillies in 2009. Alex Rodriguez hit rock bottom in the spring of 2009. Outed on steroid use, facing career-threatening hip surgery and considered A-Fraud by many fans, especially Yankee fans, Rodriguez had a permanent seat in the dead-end cafe. Six months later, Alex Rodriguez was riding shotgun down Broadway in the Yankees victory parade. Criticized for choking in the clutch, he was arguably the Yankees MVP throughout their playoff run, with dramatic late-inning home runs against both the Twins and Angels and the biggest hit of the World Series, a two-out double in the ninth inning of Game Four that gave the Yankees the win and an insurmountable 3-1 lead against the Phillies. Coming off a year in which he wound up with 30 homers and 100 RBIs despite missing 38 games, A-Rod was warming up for the post-season, where he hit..365 with six homers and 18 RBIs, just one off the major league record. It doesn’t take a psychologist to figure out what happened to A-Rod. He had bottomed out. He had nowhere to go but up. Suddenly he was playing with house money. He rolled the dice. Then, once Rodriguez had the hip surgery and began his rehabilitation, he realized he was going to get a second chance on the ballfield. A-Rod this year was a changed man. A different man than the one Selena Roberts described. in her book. Sure, Alex Rodriguez still needs to be needed. That won’t change. But in 2009, Change-Rod learned to dodge out of the spotlight. He wasn’t the only Yankee superstar. He let his exploits speak for themselves. He became more of a Yankee teammate, a brother in arms. You could tell by his facial expressions, his body language, that he was finally able to fully enjoy the successes of his teammates as well as his own. All the way to a World Championship. Yep, it paid off for Pay-Rod in the end. It would have been a tight squeeze, but with a little ingenuity fans could have seen the Knicks, Giants and Rangers on the same day. The enterprising New York could have caught three originals franchises in action today – the Knicks, Giants and Rangers. Sure, it’s probably happened before. And it would have taken some hop-scotch back and forth across or under the Hudson to make it happen again. But if anyone out there did it, send me a post card. When the Giants are going right, the opposing quarterback – not Eli Manning – is the guy facing the big pass rush. Since their Thanksgiving Day debacle in Denver, the New York Giants have had 10 days to figure things out; 10 days to try and save their season. The Giants, pre-season picks to win the Super Bowl in some circles, showed why they are the NFL’s most overrated team in that 26-6 drubbing by the Broncos. . They looked like turkeys against the Broncos. It was their fifth loss in six games following a 5-0 start. 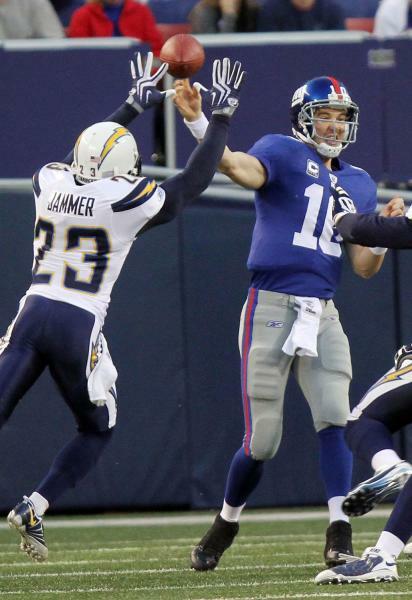 Even during their bad times, the Giants have almost always played their trademark smashmouth football style. Put pressure on the quarterback and stop the running game on defense. Maintain ball control with a strong running attack on offense. Not lately. These Giants have been imposters in blue. “Well to be honest with you, I don’t even know what is going on.” defensive end Osi Umenyiora, left, said earlier this week. That was before Tom Coughlin decided to bench both Osi and Fred Robbins — at least in certain situations — when the Giants play their divisional rival, the Dallas Cowboys, on Sunday. The National Football League can be very forgiving. In spite of their prolonged slide, the Giants have a chance to turn their season around against their hated rivals. A win over the Cowboys would put the Giants just a game behind Dallas in the NFC East. And the Giants would own the tiebreaker over the Cowboys by virtue of a 33-31 win that spoiled the opener of Cowboys Stadium. Following the Dallas game, the Giants host another divisional rival and playoff contender, the Philadelphia Eagles. The G-Men wrap up their season with road games at Washington and Minnesota, sandwiched around a home tilt with Carolina. Amazingly, if they can figure things out in time, the Giants could still make a playoff run. They have the talent — less than two years ago they won the Super Bowl, and last year they started out 11-1 before losing four of their last five games, including a home playoff loss to the Eagles. So which Giants team will show up against the Cowboys — the Super Bowl contender or the club that’ has lost nine times in its last 16 games?